All items can be purchased at the front desk at the time of your child’s next appointment, or stop in any time! Chewy tubes are designed to provide a resilient, non-food, chewy surface for children to practice biting and chewing skills. They may be used as a tool in treatment for individuals developing oral motor skills, or can be used for individuals seeking additional proprioceptive input to the jaw for enjoyment. A chewy tube can be an alternative option for a child who frequently mouths toys or other objects. Recommended approximately 3 years and up with supervision. Prolonged use of bottles or use of sippy cups prevents normal development of the mouth. As an alternative its recommended children drink with a straw by 9 months or open cup held by adult within their first 12 months as these options promote mature oral development. 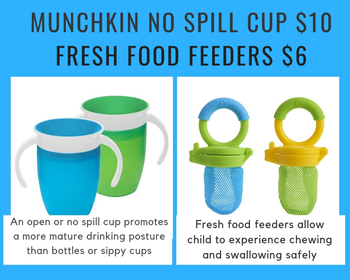 The Munchkin 360 no-spill cup provides the same opportunity for a child’s mouth to develop but helps protect from spills. Support early language development at home! With this kit caregivers will be all set to help support their early communicator’s speech and language skills together, between speech therapy sessions. This kit include 25+ tips for developing communication, NO-SPILL bubbles, 2 story books with visual supports, 2 wind-up toys, a beach ball, stacking blocks, and a bag full of visual choices to aid communication. 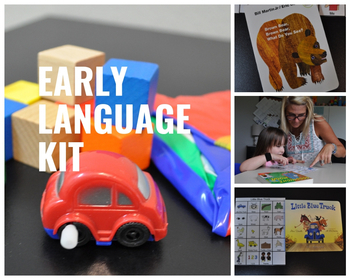 This kit was developed by our speech-language therapy staff specifically for at home practice! Recommended for children ~1-4 years old or who are not yet requesting or playing age appropriately. 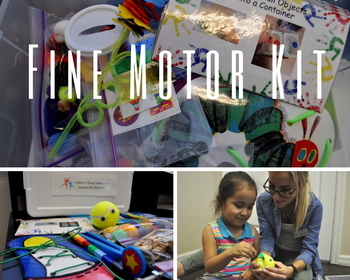 Kits include a variety of fine motor items and booklets with descriptions of fun ways your child can use each item to improve fine motor skills. Beginner kits are generally recommended for children 4 and under and advanced kits for children 5 and up. However, ultimately your child’s fine motor skill level will determine which kit best suits their needs. -Beginner kits include: lacing card, playdoh, playdoh scissors, large beads with string etc. -Advanced kits include: shoe tying card, small beads with string, stackable crayon etc. Theraputty is a fun option that helps develop fine motor skills, hand strength, coordination, and spatial awareness. Theraputty comes in a variety of resistances. 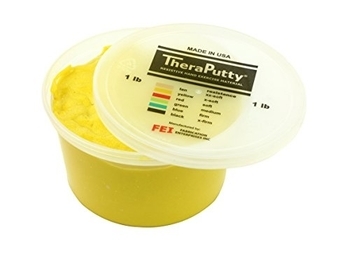 To build hand strength small objects may be hidden within the putty for your child to retrieve. Other exercises include breaking it into pieces using thumb and index finger as a fine motor task, or squeezing and manipulating the putty for deep pressure work. Your child’s Occupational Therapist can offer more creative ideas for use of Theraputty at home, specific to your child. The texture across the bottom of the spoon provides increased awareness and stability for feeding. It aids in transitioning from pureed to textured foods by introducing nonnutritive texture. 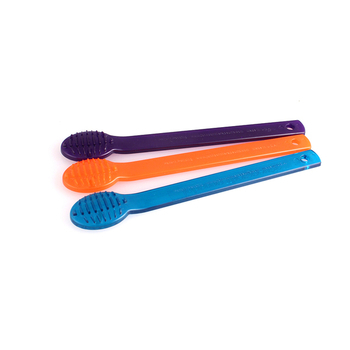 The shape and shallowness of the spoon’s bowl makes food easier to remove for beginner feeders or those with developing oral motor abilities. 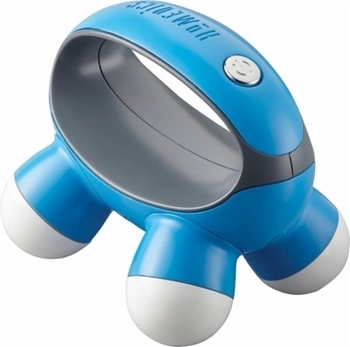 Its miniature size makes this massager easily portable and is a great option to have accessible to assist your child in calming down. It is a great option for a tactile sensory seeker. Deep touch sensation through the mini massager can provide tactile input, which sends calming signals throughout the body. Promotes dental care and/or provides deep pressure to the oral cavity. It can also be used as a sensory tool to brush areas of the external mouth (lips, cheeks, jawline). Includes a Gel bag, Scented bubbles, Rice shaker, Animal loofah, Pull tube, Stress ball balloon, Wikki Stix, and a Stretchy toy all in a portable kit. This kit is portable and packable so you can be prepared to manage your child’s sensory needs on-the-go. 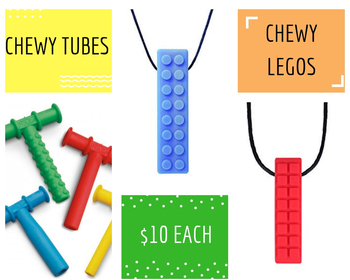 The chewy Lego necklace offers your child a wearable option to meet oral sensory needs. With a bumpy silicone texture children who may seek proprioceptive input to the jaw often enjoy the chewy Lego. On a necklace, your child has the option to use it as needed to meet chewing needs and offers a replacement to chewing on shirt collars, hands, or other objects. A mesh feeder offers a baby or toddler chewing practice with textures, sizes and shapes of foods important for their development that they otherwise might not be ready to safely eat. It helps children during their transition to taking in solid food while promoting independence with self-feeding. These specific feeders are recommended for children 6 months and up with supervision.